It was only two days ago that one of Charlie Rose’s guests, Politico’s Jim VandeHei, celebrated the disappearance of many outspoken Republicans from the political scene. On last night’s show, Rose invited on a pair of brash Democrats who vanished from Congress recently: former Sen. Chris Dodd and former Rep. Barney Frank. The former lawmakers were there to discuss the 2010 financial regulatory reform law that bears their names. Rose’s third guest, Robert Kaiser of The Washington Post, recently wrote a book about the Dodd-Frank Act’s journey from conception to passage. Wouldn't you know it, Kaiser was there to sing the praises of the Democrats appearing on the program, hailing the Dodd-Frank Act as a sort of congressional triumph over partisan politics. After Rick Perry ended his presidential bid on Thursday, the Associated Press's Chris Tomlinson opened his dispatch about the announcement thusly: "Gov. Rick Perry dropped out of the presidential race on Thursday, endorsed his old friend Newt Gingrich and returned home to Texas, where the failed White House candidate has three years left to serve as the chief executive." Based on much of his prior reportage, Tomlinson appears have a particular animus towards the Texas Governor. But tagging GOP presidential candidates or their candidacies as "failed" is not an aberration at the AP, while the wire service's omission of such tags on wildly unsuccessful Democratic candidates pointedly betrays the presence of obvious bias. Interviewing former Democratic Senator Chris Dodd on Sunday for Meet the Press's Press Pass, host David Gregory described Dodd's exit from politics this way: "...you stepped out of politics, and one of the things that you were really disappointed about what – the state of the politics in Washington, the inability to compromise, the venomous relationship in Washington..."
That was quite a charitable characterization of Dodd's decision not to run for reelection. In 2010, The Washington Post explained the real reason for Dodd's retirement: "Dodd's political star fell over a two-year period...[he] was linked to a VIP mortgage loan program overseen by a controversial Wall Street financier. He also drew harsh questions about his oversight of Wall Street, as chair of the Senate Banking Committee, in the years when the nation's financial system was heading toward near collapse." If you only read Thursday's coverage of Bank of America's decision to impose a $5 monthly debit card fee by Associated Press Personal Finance Writer Candice Choi, you would have no idea that last year's "Dodd–Frank Wall Street Reform and Consumer Protection Act" triggered BofA's decision. The legislation gave the Federal Reserve the power to limit debit card interchange fees. The Fed's limit -- 21 cents plus 0.5% of each purchase transaction -- basically cut the banks' fees by about half from their pre-Dodd-Frank level. CardHub.com estimates that the cap will reduce banks' fee income by $9.4 billion annually. It seems that not even the truth can possibly overturn the narrative that President Obama and the Democrats in Congress have brought transparency to Washington. Last Wednesday I wrote about how the Dodd-Frank financial regulatory bill Obama signed into law last month contains a provision exempting the Securities and Exchange Commission from Freedom of Information Act requests. Such an exemption would surely have been grounds for a media outcry during the Bush administration, yet apart from The Wall Street Journal and CNN, only blogs have been following the developments. The latter opted simply to parrot the administration's claims without challenge. Other media ouetlets, such as National Public Radio and MSNBC, completely ignored the controversy, in stark contrast to their extensive coverage of the Bush administration's attempts to curtail the scope of the Freedom of Information Act. NPR's Don Gonyea said "When conflicts arise over what should or should not be open, the administration does not hesitate to invoke the memory of 9/11. And while it's true that 9/11 changed the security landscape, it's also true that the administration was tightening the control of information much earlier . . ."
As congressional Democrats press on with their attempts to get financial legislation reform passed, a key component has been lacking from the debate: how to handle the government-sponsored enterprises Fannie Mae (NYSE:FNM) and Freddie Mac (NYSE:FRE). Although some Republican lawmakers have cried foul over the fact nothing has been included in a bill sponsored by Senate Banking Committee Chairman Sen. Chris Dodd, (D-Conn.), President Barack Obama's administration has vowed to pursue reforming the GSEs ... eventually. However, despite a long history of alleged corruption, close ties to the current administration and a recent $10-billion extension of "emergency aid" to Freddie and Fannie in the deadest possible part of the news cycle, these two entities have gone relatively unnoticed by the news media, with a lion's share of the spotlight given to Wall Street bogeymen like Goldman Sachs (NYSE:GS). CBS “Early Show” host Harry Smith used the top of the broadcast today to transmit liberal talking points on health care reform without bringing on a single conservative to articulate opposition. It is expected to increase assistance for lower income people to afford health care, increase federal funding for the Medicaid program, and raise prescription drug benefits under Medicare. If the bills are signed into law, they would immediately forbid insurers from setting limits on dollar coverage or canceling policies in most cases. Children could then remain on their parents' insurance until age 26. In 2014, most Americans would be required to carry health insurance. There would be a health insurance exchange and insurers would then not be able to deny coverage for pre-existing conditions. But meanwhile, the heat is really on. The President has been holding some one-on-one meetings with freshman House Democrats to try to persuade them. They are the people most vulnerable to the pressures to get this bill passed. Back on Christmas Eve of 2009, Obama's Treasury Dept. said it would lift the limits on what the federal government could provide in "emergency aid" to Fannie Mae and Freddie Mac - without seeking Congressional permission. Very few reporters noticed, except for The Washington Post's Zachary Goldfarb who reported the story on Christmas Day and CNBC CME Group reporter and tea party inspiration Rick Santelli, who later pleaded for the public to take notice. With that occurrence in mind, Santelli scoffed at Sen. Chris Dodd's, D-Conn., legislative proposal of financial system reform that did not include reforms on both Fannie Mae (NYSE:FNM) and Freddie Mac (NYSE:FRE). "You know, I can't believe, first of all - you said, may not be included. They are not going to be included," Santelli said on "Fast Money" March 12. "And I think to put a moniker of reform on something that doesn't include Freddie and Fannie is very disingenuous. And I think that to pass something - what I heard Mr. Dodd say, Sen. Dodd, was, you know, it's the 101st senator. In other words, you know, we'll pass anything we have to show that we're doing something, no matter if it's the right thing or not, you know, I'm not buying that again." All this week CNN has been taking a look at “Broken Government” and in some cases the cable channel deviated from the mainstream media norm by providing a critical view of government. 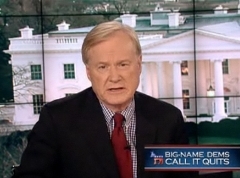 A few weeks after admitting being a liberal, MSNBC's Chris Matthews is now claiming the Republican Party has done absolutely nothing for the American people the last ten to twenty years. On Wednesday's "Hardball," Matthews brought political strategists Todd Harris and Steve McMahon on to discuss what the imminent retirements of Sen Chris Dodd (D-Conn.) and Sen. Byron Dorgan (D-N.D.) mean to the future of the Democrat Party and the upcoming midterm elections. In the midst of a left-slanting report on Sen. Chris Dodd’s (D-CT) triumphant return to his home state, there was a brief moment of sanity provided by (presumably) a Dodd constituent. REPORTER: A tired, but triumphant Senator Chris Dodd meets the media just hours after passing health care reform in the Senate, but he is heckled from a passer-by. JOHN Q. HECKLER: You’re not going to get re-elected. SEN. CHRIS DODD: And uh – thanks. Merry Christmas!